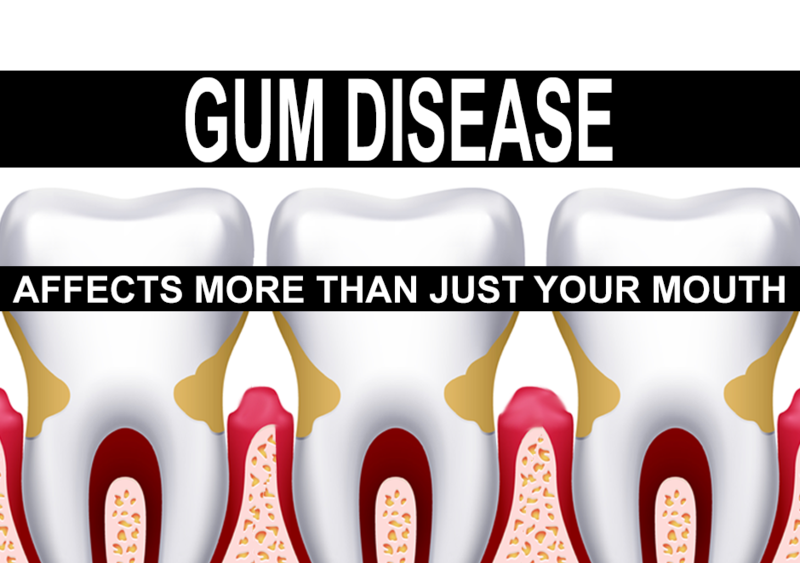 Gum disease also known as periodontal disease can affect your whole-body health. According to a new study published in Journal of the National Cancer Institute, has found a startling link between severe gum disease and cancer rates. The study followed almost 7,500 individuals in four different states: Maryland, Mississippi, Minnesota and North Carolina. None of these individuals had cancer at the beginning of the study. The study found at fifteen years, individuals with severe gum disease had a 24 percent higher risk of developing cancers of any kind. Some specific cancers such as lung cancer had double the risk in those with severe gum disease compared to those with no or mild gum disease. Another recent study directed by Dr. Sorsa in Finland published in the International Journal of Cancer, found gum disease was associated with a 33% increased risk in overall cancer mortality. This study also found that the mortality risk in individuals with pancreatic cancer was more than twofold the increased risk compared to those without gum disease. What can you do about gum disease? Diagnosis is the first step. Your dental health professional will use a periodontal probe, think of it as a tiny ruler, to measure the health of your gums. They will be looking for healthy numbers of 1-3 mm pocket depths around the teeth. If there are areas of 4mm, hopefully it was caught in time and a good cleaning, improved oral hygiene and twice a year cleanings can reverse this inflammation. If the pockets depths are 5mm and beyond, the gum disease has progressed to a destructive, irreversible phase. Treatment requires a deep cleaning, known as scaling and root planning (SRP). Your dental health professional will get you numb in the areas with the deeper pockets and clean below the gum line. This is a spot that your toothbrush and floss can’t reach. If the pockets are very advanced, you may be referred to a periodontist, a gum specialist. They may complete more advanced procedures with the hope of getting the gum disease under control. Besides the overall health risks of not treating gum disease, you may experience pain, swelling, infection and ultimately tooth loss. The bone around the teeth acts as the support for the tooth root to anchor. Without a strong foundation of bone, teeth will become mobile and eventually will be lost due to poor support. Have your periodontal examination completed by your dentist and follow through with treatments to reduce your risks to your oral and overall health.